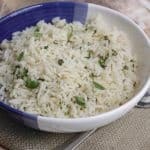 Cilantro Lime Rice a versatile side dish that you can use with your favorite Mexican meal or burrito. Make a big batch and store the extras in the freezer! 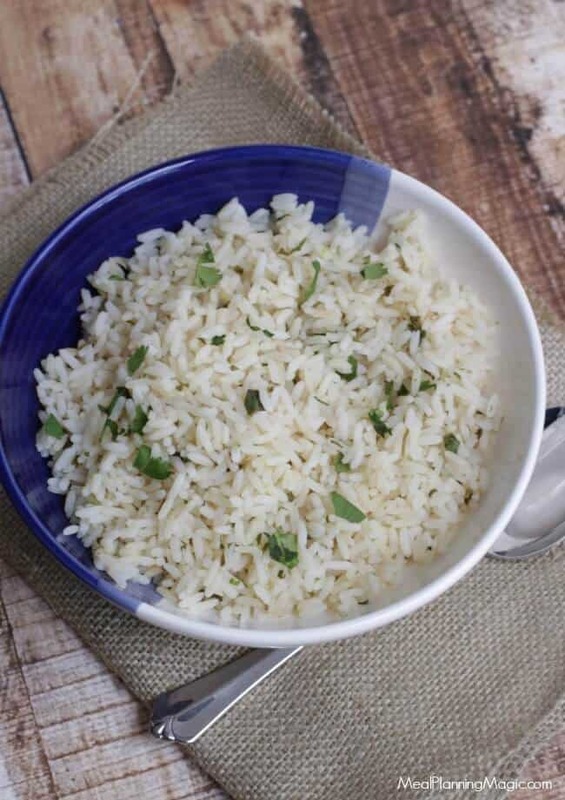 Click here to PIN this Cilantro Lime Rice recipe! You’d think living in southeast Texas that I’d like going out for Tex-Mex food more often but whenever people ask me what my favorite Mexican food restaurant is, I usually reply that I don’t have a favorite (well, I DO have a favorite but it’s pretty expensive so we don’t go there too often!) I think it’s because I have lived in Texas so long that I have learned to cook so many different Tex-Mex recipes that I don’t often think about going out for it. I’ve been making it so long and have come to realize many Tex-Mex recipes are so easy to make at home that I’d rather save our money for something that I’m less likely to prepare at home. Spanish Beef and Rice Skillet Dinneris one of our favorites as well as fajitas and tacos which seem to be staples in our house. Even when I don’t feel like grilling outside (which we can do pretty much year round), I can easily make these Simple Slowcooker Steak and Chicken Fajitas. We also love these simple Beef and Bean Burritos. And I dare you to limit yourself to just a few chips when eating my Mexican Spinach Dip! Why am I telling you about all these other recipes and not the Cilantro Lime Rice that you came here for? Because this rice easily pairs with those dishes I’ve mentioned and just about any Mexican style dish. 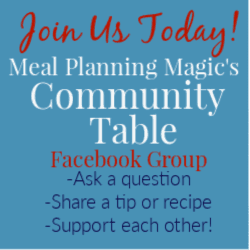 Granted, the Mexican Spinach Dip is meant to be an appetizer but I’ll let you know that it makes a great addition to fajitas or burritos too! So today, I’m sharing this Cilantro Lime Rice recipe with you today because it’s so crazy easy that you need to add it to your recipe rotation soon! 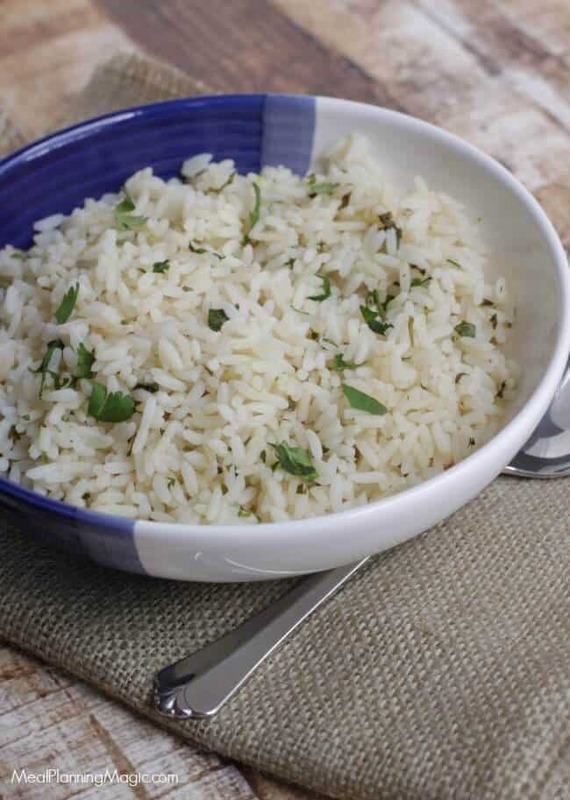 The combination of lime and cilantro adds a unique twist to your simpler rice side dishes. If you like burrito places like Chipotle, then you are going to love this rice—it tastes just like what they make. 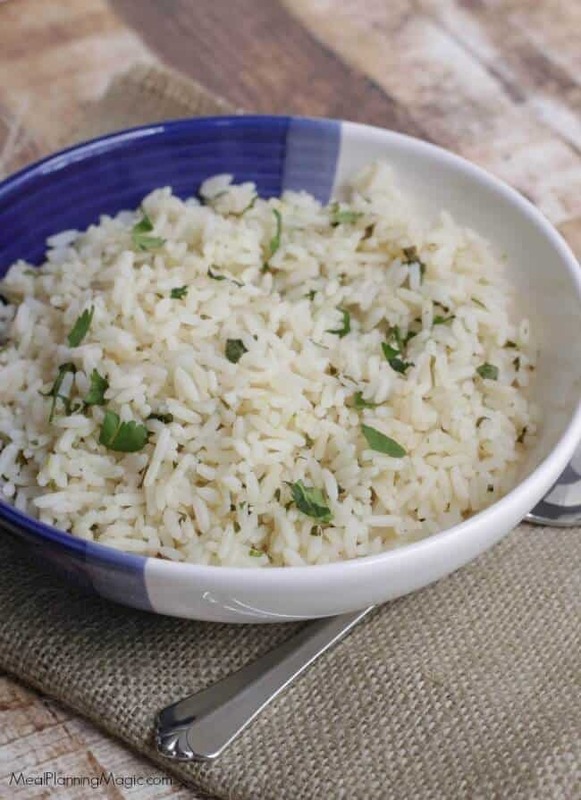 Best of all, you can double or triple this Cilantro Lime Rice recipe and freeze the extras so you always have some on hand when you need a quick and easy side to go with dinner. I hope you’ll give it a try! In a large saucepan, combine water and rice. Cover and cook on high to bring to a boil. Reduce heat and simmer for 20 minutes or until water is absorbed and fully cooked. Stir in grated lime peel, lime juice and cilantro. Serve warm. If making a double (or triple batch) to freeze extras, allow rice mixture to cool. Divide Cilantro Lime Rice between three quart size ziptop bags. To use, thaw in refrigerator. Transfer to a glass bowl and warm in microwave on high for 4-6 minutes or until hot.